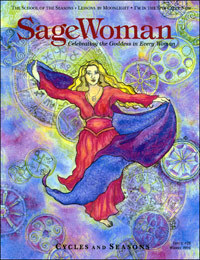 SageWoman #28 (reprint) Cycles & Seasons [sw028p] - $9.95 : BBI Media - Magazines that feed your soul. Find the beauty and strength of attuning yourself with the seasons in this popular issue. Includes Waverly Fitzgerald's article on the School of the Seasons: Winter, Goddesses of Winter, lots and lots of moon rituals, articles on menopause, medicine wheels, southern hemisphere Wicca, and Diana Paxson's article on Grandmother Spider: Spinner of Wisdom. Plus columns on magical timing, Love Magic for Valentine's Day, and rituals for Winter Solstice, Brigid/Imbolc, Croning and Thanksgiving. 80 illustrated pages, published in Winter of 1994.